Metal Badge Clips With Swivel Head - On Special Sale Now! This metal badge clip comes with a round ring at the top of the clip. The 3/8" ring can easily be used to loop lanyard straps, round-braided cords, elastic strings or ball chains through. 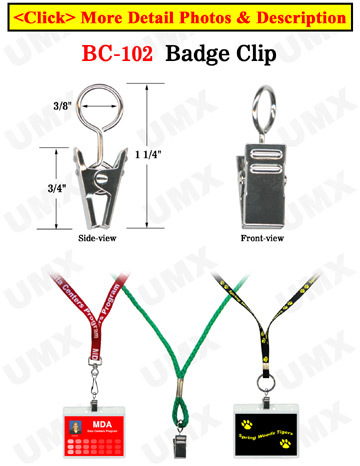 The badge clip can be mounted vertically and swiveled.